Sarah with her gold medal award for The M&G Garden. This year, Sarah’s design aimed to invoke a peaceful, dream-like haven that’s inspired by Mediterranean landscapes. 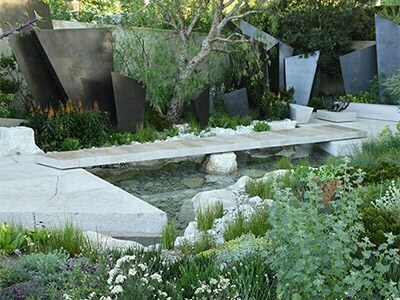 The meadow-inspired planting style features deep punctuations of colour and exaggerated layering to create variations in height. 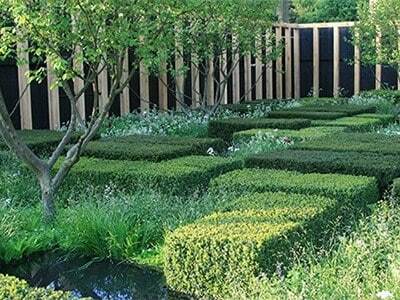 Sarah designed the layering element of the garden by tearing multiple border sketches until she saw the effect she was looking for. 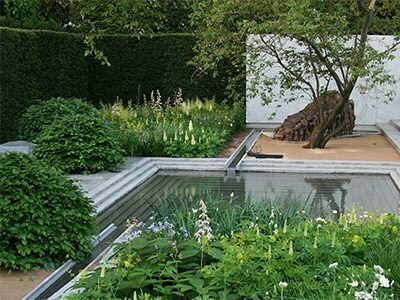 The garden is divided by walls to create a succession of framed views. 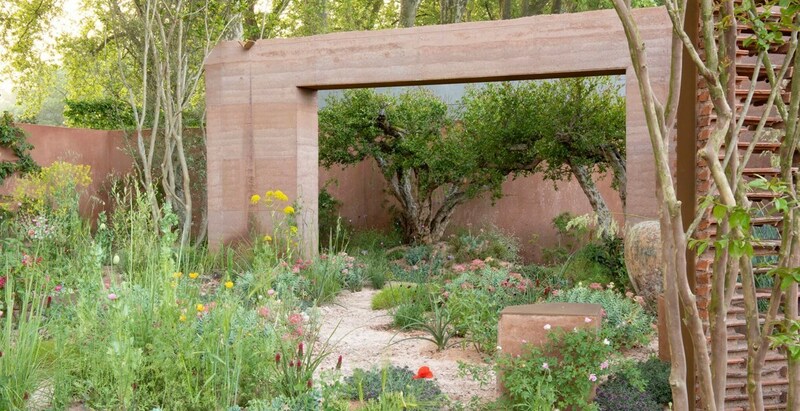 These and other structural elements of the garden are created using rammed earth construction, an ancient method that makes use of sustainable, natural materials. 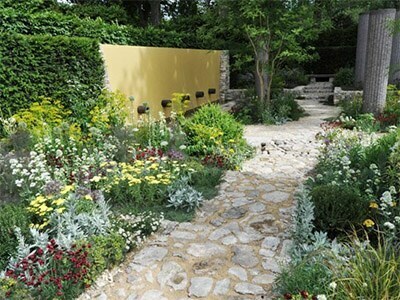 Using a variety of materials such as sand, silt, gravel and clay; the walls will have a graduated colour effect that brings a warm, Mediterranean feel to the garden. 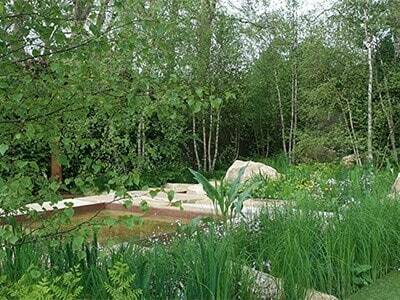 Sarah’s choice of plants also reflect the Mediterranean inspiration behind the garden. 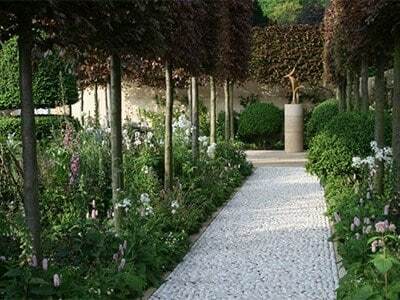 The garden features twisted wisteria stems, warmth-loving Lagerstroemia trees, scented thyme and in the very heart of the garden, two mature pomegranate trees. 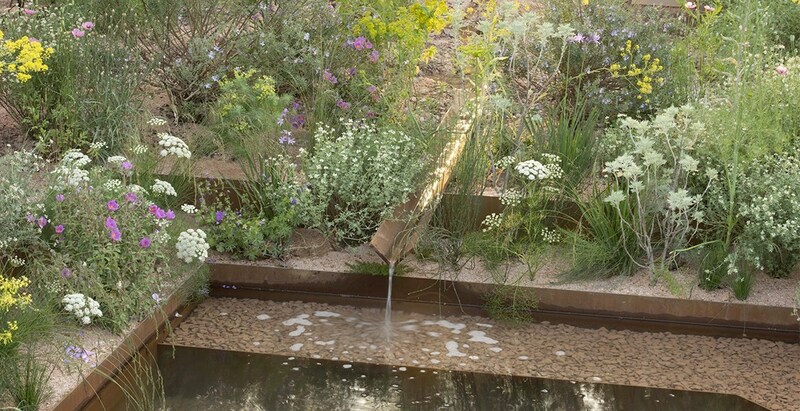 In line with the meadow style planting, grasses are used to lend softened edges to the mix of flowers. Around the garden’s pathways gravel scree plantings of Asphodelus and Dianthus lend a natural, relaxed mood. The colour combinations employed are attention-grabbing with intriguing clashes of deep pinks, lilacs and yellows with an interspersal of statement red poppies. Sarah’s initial inspiration behind her design draws on her artistic background. She was influenced by the Claude Monet’s soft, natural outlines; the framing walls and windows of Pierre Bonnard; and the bright use of punctuating colour favoured by the Mexican architect Luis Barragan. The dividing walls create a succession of framed views. 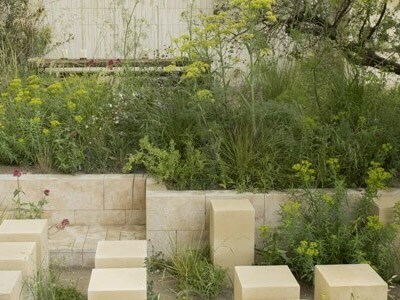 Different textures bring a warm, Mediterranean feel to the garden. 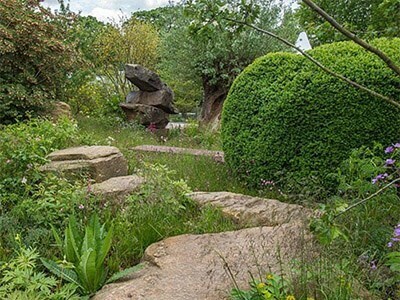 The meadow-inspired planting style features deep punctuation's of colour. Exaggerated layering creates variations in height.